Historically, grill buyers were told to look for a grill that produces around 100 BTUs per square inch. BTUs—standing for British Thermal Units—is a traditional way of measuring thermal output of a heating appliance. Technically, one BTU is the amount of energy required to heat one pound of water by one degree Fahrenheit. Today, however, this rule is passé, as salespeople now advise you to factor in how hot the grill actually gets, rather than how much fuel it burns. So do BTUs even matter anymore? A BTU rating on a grill specifies the maximum output of the primary or main burners (the burners that reside underneath the cooking grate). This rating does not include the BTU output of any side burners, or rotisserie or smoker burners. Still, some manufacturers lump all the figures together, tricking you into thinking a grill is much more powerful than it really is. Some brands also try to overstate the BTUs-per-square-inch, by combining the total measurements of all of the cooking services (including the accessory burners). This fools you into thinking the grill is actually bigger than it is. When shopping for grills, it is important to note the sturdiness of the components and the overall size of the grill. These factors can often compensate for a lower BTU rating. Good-quality, sturdy grills with heavy metal parts—especially the cooking grates—may have lower BTU ratings than cheap grills, since they are better able to trap and hold the heat produced. A good grill also will have small vents to allow a controlled amount of air flow through the cooking chamber, allowing it to heat up quickly and maintain a high temperature. Cheaper grills may well have a higher BTU rating, but because they do not heat up as fast or hold heat as well, their ability to cook a steak (for example) may be inferior. Infrared grills are different. While the burners of a standard gas grill heat the cooking chamber by convection, an infrared grill converts the heat of its burners to radiant energy by limiting airflow. This allows the chamber to heat up fast and maintain a high temperature, making this type of grill one of the most efficient on the market (hence the lower BTU-per-square-inch rating). That said, fast and hot doesn't always mean better tasting. So, before you try this trendy option, sample meat that's been grilled by infrared burners and see if it suits your expectations. Today's grills are more efficient than older models and typically don't need the high BTU output that was once common. 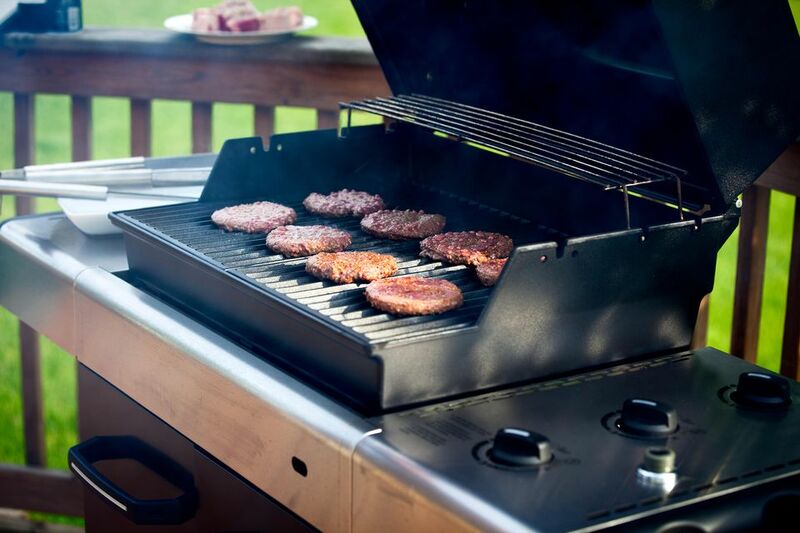 When buying a standard gas grill, look at how the lid fits the body. If it fits snugly and the grill's components are heavy, a grill with 80 to 100 BTUs-per-square-inch will heat up quickly and maintain cooking heat. The same rules apply for an infrared grill, but the BTUs should be more in the 60 to 80 BTU range. Of course, BTU ratings will vary greatly, but if you stick to these specifications you won't be disappointed. Beware. A grill with a very high BTU-per-square-inch rating is probably hiding inferior design and construction. The lid might be thin, the grates lightweight, and the vents poorly designed. Or, the specifications may be calculated in a deceptive manner. These gas grills, engineered to cut costs, should be avoided. And if a grill advertises a BTU range lower than the recommended ranges above, chances are it will be slow to preheat and will have a slower recovery time (the time it takes for a grill to heat back up after opening and closing the lid). If you stay in the 80- to 100-BTU-per-square-inch range for a standard grill, or 60- to 80-BTU-per-square-inch for an infrared grill, you will likely be satisfied.